Craigslist, Craig Newmark’s 1995 based classifieds website, had a barebones design even for the mid-nineties. Almost antithetical to the ever-changing world of the modern web, where certain sites change their layout on a seemingly never-ending basis (yes I’m looking at you Facebook), the service stuck with that look ever since. The plain looks of the service is tolerable – even admirable on some level – but there are times when you want a little eye candy. 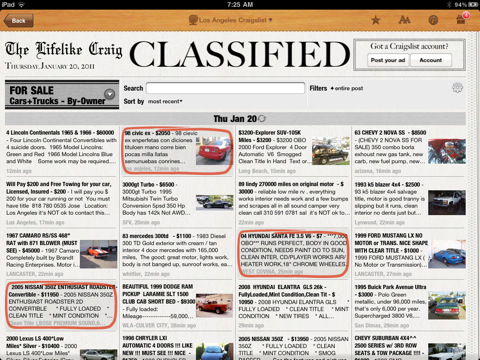 Or at least that is the idea behind Lifelike Craig HD, a new $1.99 (£1.19) iPad app that skins the content of Craiglist in a lovely old-fashioned newspaper UI. It’s a little odd replacing one old looking design template from 1995, with a newspaper UI, which is even older, but for some reason it’s a design paradigm that mostly works, and browsing via the skin is fast and fun. I used to spend a lot of time perusing Loot for second hand musical instruments as a youth and Lifelike Criag HD manages to evoke and even improve upon that experience – the change in layout makes it easier to explore all the various lists – and stumble upon hidden gems. I went to Dublin on the weekend and fired up Lifelike Craig HD. The location aware settings meant I was instantly treated to a wealth of local data, which gave it a wonderful old school feel of picking up a local newspaper and seeing what gigs were going down in town. Of course it’s not all just paradigm shifting eye-candy. Lifelike Craig HD packs a few useful features in beyond simply skinning the main website. You can log in to and control your (or multiple if you are that way inclined) Craigslist account from within the app and make posts, email posts to friends from directly within the app and save searches. Built in Maps integration means you can see the location of various posts, which is also handy in deciding if you want to haul a bargain across town or not. 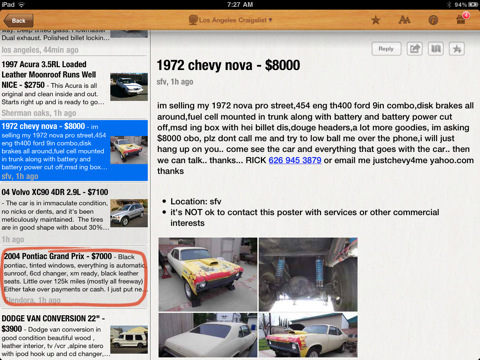 If you spend a lot of time poking around on Craigslist and like the look of this app from the screenshots it’s hard not to recommend laying down the $1.99 they are charging. AppSafari review of Lifelike Craig HD was written by Shem Pennant on February 2nd, 2011 and categorized under App Store, Directories, iPad apps, Local, Search, Shopping. Page viewed 5571 times, 1 so far today. Need help on using these apps? Please read the Help Page. Hey, welcome to AppSafari! Quick question. Why did you rate the app 3/5 when it seems to be a good one? At least according to your review? Are there any downsides that make it average because I’m considering picking this one up.